Would you like to look 5 or more years younger? We are pleased to offer Anti-ageing Facial Acupuncture, an effective way to help you look and feel younger without the unwanted side effects or huge expense of Botox or cosmetic surgery. Acupuncture offers you an effective long-lasting treatment, which not only avoids the toxins of Botox and the dangers, pain and bruising of surgery, but can also boost your general health, treating underlying ailments whilst encouraging a more radiant and youthful appearance. A recent report in the International Journal of Clinical Acupuncture found that 90% of 300 patients felt they benefited markedly from a single course of treatment. The procedure is gaining in popularity across the world, with many Hollywood stars among its fans. 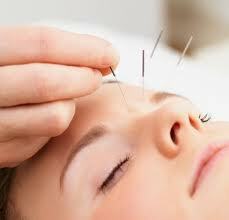 As with all our acupuncture, the treatment follows the principles of Traditional Chinese medicine. It is holistic and tailored to each individual, aiming to give you a younger, more radiant appearance by treating the underlying factors which contribute to the ageing process, boosting the circulation and enhancing the body’s “Qi” or energy. It is a treatment designed to rejuvenate and revitalise the whole body whilst also targeting signs of facial ageing. The appearance of the facial skin can be improved by an increase in the production of collagen, improved muscle tone, reduction in puffiness and the tightening of pores. Fine lines may be eliminated and wrinkles reduced. During the treatment fine sterile, disposable needles are inserted into particular areas of the face, ears, neck, hands, legs and trunk according to the needs of each individual. By using the meridians of Traditional Chinese Medicine, our practitioners work directly on the face and on the underlying causes of any problems. Along with acupuncture, Chinese Herbal Medication can play an important part in your treatment, and you will also receive lifestyle advice, for instance diet and nutrition. Different age groups will have different needs, as will the individual people within these age groups, and our practitioners are all highly skilled in diagnosing these needs and problems. Our treatment for this age group focuses on prevention. We aim to boost skin elasticity and texture. Perhaps you suffer from a hormone imbalance resulting in skin problems. Treatment may also be directed at correcting your energy balance or relieving stress. In terms of Chinese medicine we focus on the liver to aid detox. This can be a very busy and stressful stage of a woman’s life when pregnancies, childcare and career may lead to increased stress and decreased energy. Treatment for this age group may focus on promoting the circulation and the flow of Qi, increasing your energy levels and restoring your radiant appearance. The kidney and spleen are important here as they control blood, circulation, muscles and ligaments. As hormone levels change, so metabolism and other body systems slow down. This includes the ability of the skin to regenerate, often resulting in dry, sagging skin, fine lines and wrinkles. Treatment aims to encourage the process of cell recovery and regeneration whilst boosting the circulation and energy levels and relieving any stress. The kidney and spleen are again important for this age group, giving a boost to the central energy which can be depleted in this age group. Whatever your age, our treatment promotes inner health and outer beauty. When any internal imbalance is corrected, not only does your health improve, but so does your facial appearance.